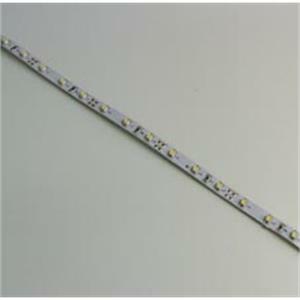 LED Striplights for 12V DC: Flexible Self Adhesive 30 LED Light Strip with Warm White LEDS. Description A flexible self adhesive strip of 30 Warm White LEDs together with associated circuitry for connecting to 12V DC. Each strip can be cut into 10 x 3 LED pieces or multiples of 3 LEDs. Just connect to 12v DC power supply. Self adhesive backing can be fixed almost anywhere. High intensity output with low power consumption. Long life LED. Approx. 50,000 hours. Each LED has 120 degree viewing angle for even light distribution. Dimensions 500mm x 8mm.